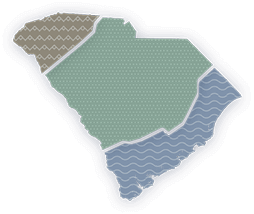 From the majestic mountains of the Upcountry and the Midlands' rolling hills to the white-sand beaches of the Lowcountry, discover the South Carolina park for your state of mind. Choose your adventure at any of the 47 South Carolina state parks. Spanning the Blue Ridge Mountains to the Atlantic coast, South Carolina State Parks boast more than 80,000 acres of protected lands. Whether you're seeking the adventure of a lifetime or a sunny spot for a family picnic, our 47 state parks offer the perfect backdrop. Calling all adventure-seekers and outdoor enthusiasts! Whether you're a fearless paddleboarder, casual canoeist or avid fly fisher, Devils Fork State Park and crystal-clear Lake Jocassee offer something for everyone. Chester State Park offers visitors the opportunity to relax and get away from the hustle and bustle of everyday life. Whether you’re looking to spend the day fishing on the water or strolling through nature along the trails, Chester State Park is just the place for your serene getaway. With everything from rustic camping underneath the stars to villas equipped with flat-screens and granite countertops, Devils Fork State Park offers accommodations to fit every lifestyle and budget. Visit Caesars Head State Park and see the rock that won the name of “Caesars Head.” While opinions may differ on the origin of the name, everyone can agree that the sight itself is worth the trek.